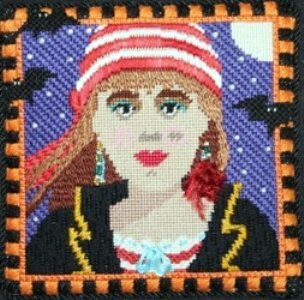 This Pirate Girl Halloween needlepoint design is handpainted onto 18 mesh Mono Zweigart needlepoint canvas. The Pirate Girl can be done alone, or as a set, made into a Candy Box. 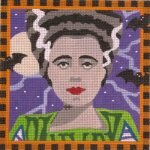 Choose from the Count Dracula, Young Frankenstein, Bride of Frankenstein, the Happy witch or Pirate Boy. If you need stretcher bars we recommend two sets of 9" bars and some thumb tacks. This Pirate Girl needlepoint canvas usually ships within 7 days. If for some reason there is a delay we will let you know.